My flight on Asiana's Airbus a380-800 actually happened by luck, as I was scheduled to fly on Cathay Pacific but last minute the flight cancelled so I had to think of a back up plan. Asiana's Flagship first class on the a380 is similar to Air China or Korean Air; basic and decent for a long haul flight. If you do a search for tickets, Asiana along with Korean Air and Air China Eastern all seem to come up with the lowest priced tickets. There's a reason for this. This first class suite is the same configuration and style as Air China; the 1-2-1 configuration in cubicle style suites with sliding privacy doors and an ottoman that doubles as a seat for a guest to dine with you. The seat is firm and spacious. The amenties are so basic it almost seems nonexistant. The food quality is pretty good, however not many choices, though the service presentation was very nice and didn't seem rushed nor did it seemed dragged on. 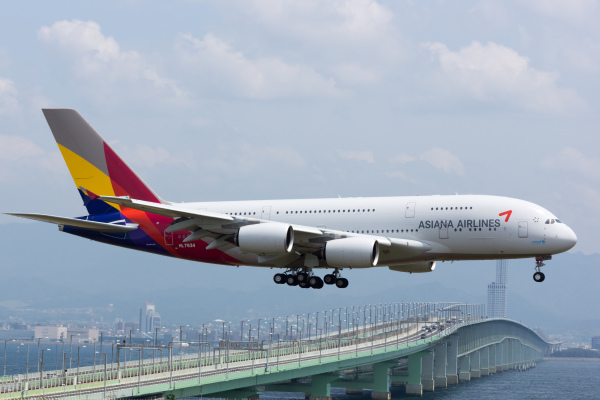 If you're looking to experience the a380 double decker and fly first class to Asia without breaking the wallet, Asiana is a great option. When you enter the cabin the first impression I received was that the cubcicle style made you feel very private, yet the color scheme was pretty boring and basic, like Air China. The Asiana colors have some blue and red, and I'm wondering why they didnt incorporate those accents into the cabin design to give more color to the presentation. The first class cabin is located on the second deck in the forward section. Like most a380's there's a section in the forward right area, just next to the staircase that is usually used for a seating lounge area with some magazines where passengers can socialize and relax, however from my experience, this section becomes a waste of space that no one really uses. Most passengers just seclude themselves in their cubcile suites for the entire flight.